The second of Friday’s semi-finals in Dubai pits Barbora Strycova and Caroline Garcia against each other in an Australian Open rematch. Strycova bagged a first win over Ana Ivanovic, 7-6(5) 6-3, in the last of the quarter-finals having failed to win more than three games against the Serb in their three previous matches. Ivanovic was a shadow of the player who beat Simona Halep on Wednesday; she looked tense, tight and anxious, coming out flat and never really striking the ball with any kind of conviction. The first set was decided on the tiebreak; Ivanovic had one foot in the door at 5-3 but a double fault, followed by a delicious drop shot-volley combo by Strycova turned the tiebreak on its head. While Ivanovic was below-par, Strycova was fully deserving of her win, winning 11 of 12 points up at the net. After a slow start in Auckland and Hobart, Strycova’s enjoyed a fruitful start to the year with runs in Melbourne and Dubai, as well as helping the Czech Fed Cup team win their first tie of the year with a win in the decisive doubles rubber with Karolina Pliskova. Strycova’s smile was infectious in her post-match interview :-). Garcia progressed into the semi-finals with a 6-3 6-4 victory over Andrea Petkovic. The big difference between the pair was the serve; Garcia was serving at 81% first serves in the first set and dropped just two points behind it, winning 11 straight points on serve to open the match. While Garcia’s first serve percentage dropped in the second set, she was still winning 80% of points behind it. This constantly transferred the pressure to Petkovic who was forced to deuce in all but one of her service games in the second set… 10 double faults also didn’t help! Garcia’s start to the year has been promising; while she lost in the first round of the Australian Open to Strycova, she won all of her singles matches at the Hopman Cup and Fed Cup. The Frenchwoman remains an enigma on the court; i’ve written in length about Garcia’s game before and been burnt so many times in trying to pick the match where she’s going to come good! Her game is wonderful to watch but there’s still a caveat attached to that as Garcia has had her overwhelming share of mental lapses in the crucial moments. February 18, 2016 in Dubai, Garcia, Strycova, WTA. I picked Garcia yesterday as my Dark Horse to win the title I will stick with her in 3 sets,though I would prefer straights,she is also having a solid tournament,also in the doubles. Yes I agree, i’d like to see Garcia with a new coach. I’m sure someone else mentioned it on here, perhaps Andrew, but i’d love to see Garcia with Mauresmo. I think that would be a winning combination. Mauresmo – are you sure? It’s not going to happen anytime soon but I think they’d be a great team. I did call for Mauresmo. They’ve worked together before for Fed Cup and Amelie was there when Garcia beat Errani at Wimbledon a couple of years ago. Mauresmo also has a pretty hot record as a coach. Both women have had fantastic weeks. I think Garcia has the game to beat Strycova and to win the title. I’m just not sure she’s quite there yet. And Babs is really playing superb tennis! As much a disappointment Ivanovic was today, the Czech played a near flawless game. If she can replicate tomorrow then she’ll make the final. Frankly speaking, I don’t think Garcia has the game to beat Strcova except she may serve a few more aces in the semi-final to help out her scorelines. FYI, She has 32 unforced errors in the QF. Barbora is not Petkovic just sitting at the back to allow Garcia slamming her forehand over and over again. Once she makes Garcia running back and forth, Garcia will make more errors. It happened in AO2016. She defeated Garcia in 2 – 62, 64. The H2H is 3-1 and she is in form. Even I like Garcia, I have to say Garcia has running out of luck. Barbora will beat Garcia. Petkovic was too tired after the late night match. She didn’t even start to play before the match was over. Barbora will trick Garcia as usual. I won’t be surprised that Barbora wins in 2. Barbora will play in the final. Ivanovic career is almost over. I won’t be surprised if she becomes a swimsuit for some magazines…..soon! You could be right about Ana’s career being almost over. Someone who knows her well let slip recently that she plans to get married soon, and once that happens she may want to leave the tour and start a family. She’s in the odd position of having had the peak of her success (winning the French Open) early in her career when she was just 20 and never winning another slam or AFAIK even making another slam final, though she did make the semis of the FO last year, so maybe she could decide soon that enough is enough. As for the swimsuits though; maybe, but I doubt it. Ana already models for Rolex (if you notice, she’s rarely seen off court without one on her wrist), and she also appeared in their sales literature recently. I’d guess that’s a lot more lucrative for her than modelling swimsuits would be. Even she has money, I am sure more is better than less. Haaaa..I am just joking if she becomes a swimsuit model. 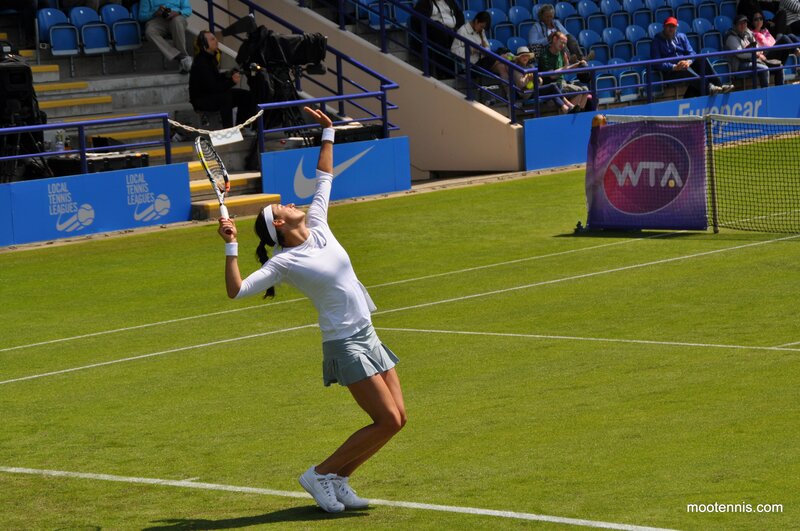 Yes it is….long back ago since last year…..I bet she can ever reach SF’s of any premier event ever again. Barbora to defeat Garcia in 2….Garcia’s is not at top form although she showed glimpses of it in Hopman cup but then since Aus open she is medicore. She was awesome in Fed Cup and this tournament which should give her a big boost going ahead to Indian Wells and Miami, courts which suit her game so well. Even though Caroline lost she took a big step in the right direction and she played a really promising match. Agree Andrew,hopefully Caroline can take the positives from this tournament and build on them. Yeah. I was most impressed that she managed to change her tactics mid match and successfully try something new. She came VERY close to winning and it was only a few points in the latter stages where she abandoned her new tactics and started over hitting again. Had she not dropped her serve I think she’d have taken it.